The political hostility between the United States of America and the Soviet Union from 1945 to 1990 not only perpetuated enemy propaganda in both countries, but was also a power battle between both nations to sell their respective ideologies to the world. Just like advertising firms use different media outlets and have to create worldwide campaigns, we will take a closer look here at how America more specifically used different media to propagate the “anti-commie” message in its own nation, but also around the world. The following analysis is rich in visual imagery and thus will be very helpful for aspiring graphic designers who throughout this section will learn more about creating a straightforward visual piece, but students in media production and journalism will also find this segment useful for future creative work. In order to transmit an effective message, it is very important to know your audience’s profile. 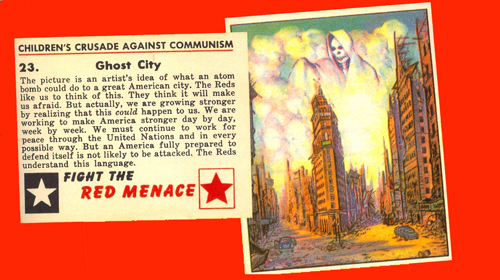 In the case of Cold War propaganda, media that were more appealing to children were highly employed in order to convey American ideologies : comic books, schools and textbooks were notably used. 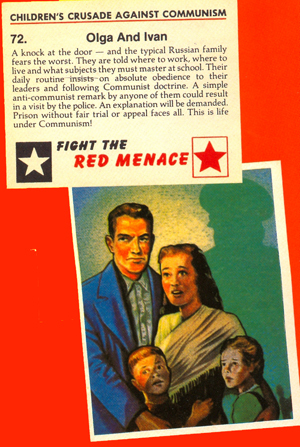 The 1951 Children’s Crusade Against Communism bubblegum cards are a great example of how propaganda is treated with a younger audience: the cards accompany bubblegums, a product that is purchased by a majority of children, and use cartoon depictions with bright colors. Furthermore, the text found in these cards is quite straightforward and easy to understand, making children who know how to read able to grasp the message with no significant difficulty. As you will be entering the work market, you will need to understand your audience and use the appropriate medium that will reach out to them effectively, but you will also have to visually and creatively fabricate this message. The following cards epitomize this concept. 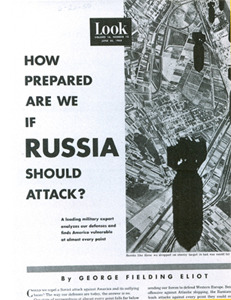 Propaganda was more extensively used in schools where educational videos produced by the American federal government’s Civil Defense department where shown in the event of a nuclear attack. The most popular film of this genre is “Duck and Cover” (1951) where children are told to do just like Burt, a friendly cartoon turtle, who avoids danger when he ducks and covers. The video shows children accomplishing this survival technique in order for to make the young audience identify with the actors. It also insists on how everybody must at all times be conscious of this nuclear threat and be ready to duck and cover. Here is the original 1951 video. Moreover, it is important to note how education served as a propaganda tool by focusing on American ideologies of freedom and democracy, and by presenting the Soviet Union as the enemy who held opposing viewpoints such as communism. This angle of teaching makes children process future events in a way that is very much controlled by the American government. This is quite relevant to those of you who will be penetrating the marketing industry and develop brand loyalty strategies as well as building consumer relationships. Here is another video that was shown in American schools throughout the 1950’s. “ President Merkin Muffley: I will not go down in history as the greatest mass-murderer since Adolf Hitler. Cold War movie posters are propaganda pieces of their own. 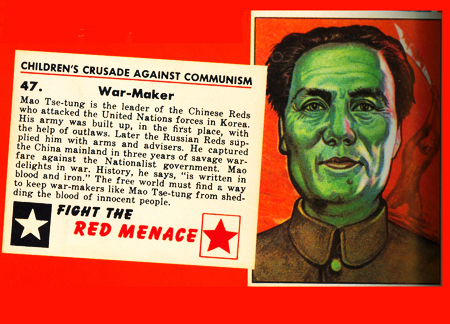 Using bold fonts, color palettes and characters that recall imagery found in Communist posters, these visual media were not only important to the Americans but also to international audiences who understood the connotative symbolism of such imagery and were as a result able to create associative links. 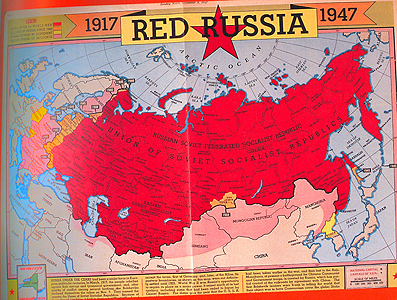 Here are some examples of visually dynamic posters where the use of red is quite dominant to recall the communism flag, but also the high probability of a bloody war. 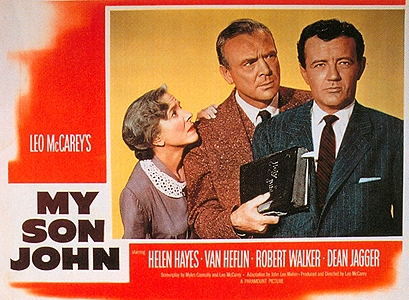 Moreover, Hollywood dealt with the theme of American paranoia during the Cold War period, and storylines very often revolved around the idea that anyone – your husband, your son, your daughter, etc. – could turn into a Communist. 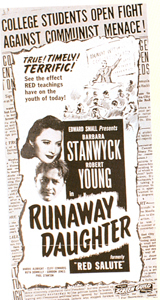 For instance, in the movie Conspirator (1949) by director Victor Saville, Elizabeth Taylor’s character shockingly learns her husband is a Communist spy agent. 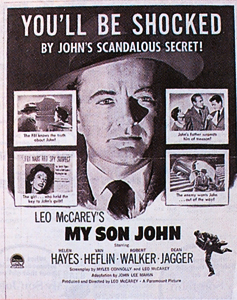 In other films such as My Son John (1952), families are broken up by one member’s allegedly brainwashed behavior of allying with the Communists. Movies as a result become an effective device to portray the traditional American family who must face painful treason due to communism. Throughout the 1950’s, Hollywood was in a very lucrative position and exported a lot of its productions worldwide. As previously mentioned, the use of easily recognizable imagery and connotative color palettes made the exportation of American films appealing to foreign audiences. Movie plots also revolved around themes that are important to American and foreign audiences such as family and trust, which made the propaganda message present in these movies pass undercover. Television was born during Cold War’s early period and since the medium was slowly growing, networks would primarily find sponsorship and financing from the State, more specifically the Defense department. 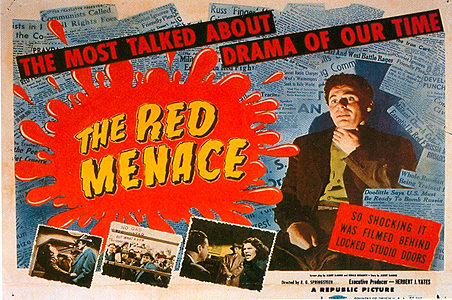 As a result, American television content would evidently focus on the West’s position about the Soviet Union, and thus the medium started being used quite extensively as a propaganda tool. 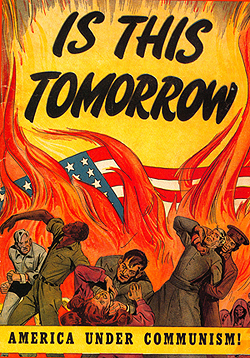 American families now had access to a propaganda medium in their homes and watched mini documentaries on what to do in the event of a nuclear attack (similarly to Duck and Cover), how to recognize an American Communist, but also newscasts about the political position of their country. Documentaries as such also played with the idea of what it was to be a true patriotic citizen. It was furthermore quite an ironic that the United States were preaching democratic ideologies and a free marketplace with free debate, when in fact television networks were given over to the American State’s propapaganda. This is interesting for students today who wish to work in media production and who will require financing for their projects: it is not unlikely that some of your financial partners will require that you alter your work’s content in order to satisfy their mandate. Below are some examples of Cold War documentaries that were shown on national television and were produced by the Defense department, American television’s primary subsidizer at the time. Print media is the last propaganda tool we will take a look at in this section. America led one of the most successful propaganda campaigns in history due primarily to the effectiveness of print media, which in this segment includes newspapers, posters and books. First of all, newspaper articles were key during the Cold War era because of their daily frequency and high circulation number: print media used to be America’s main source of information during the Cold War era. Just like movie posters, print media graphics would use recognizable imagery and bold typefaces. 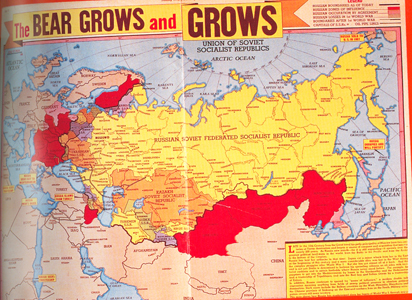 Maps of the Soviet Union, such as the one below, would often be printed to show the fearful expansion of Russia. Articles would also feature testimonials and interviews with people who were American spies in the Soviet Union or who reveal their experiences as residents of communist Russia. 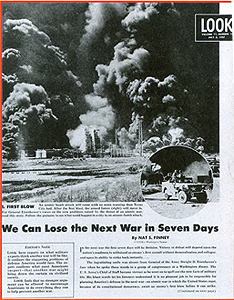 Most articles would take an angle that focused on fear and paranoia: for instance, the articles “We Can Lose the Next War in Seven Days” as well as “How Prepared Are if Russia Should Attack” from Look magazine state America’s unpreparedness for an eminent nuclear war. A lot of stories would moreover look at all the characteristics of an individual with communist allegiance, and would encourage its readership to undertake a witch hunt-like operation. As previously mentioned, in a time when television was at its early stage, print media was by far the most popular source of news for Americans. In order to truly reach out to a mass audience, you must look at where your public is getting information: today relying solely on print media would not be wise since twenty-first century individuals have access to so many different information technologies. 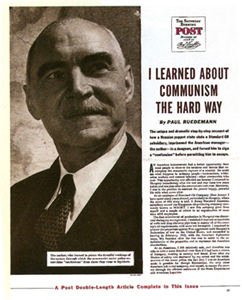 However, the stories that were found in Cold War print media are a great example of the journalistic angles that were taken by reporters to catch their readership’s attention. 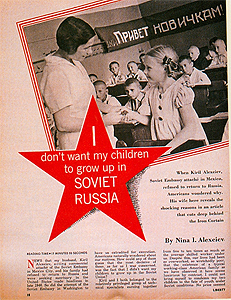 We have analyzed how Cold War propaganda spreads across education, film, television, and print media. As you will be entering the workforce, you will need to choose the medium that will best convey the message you wish to transmit. Remember to use semiotics and connotative images that will make the audience recall specific organizations or products, and which moreover enable them to create very importante associative links. The key is to use values that are close to your audience and find a way of incorporate such ideologies in your message’s content. But beware! It is quite easy to fall into the trap of manipulating mass opinion with stereotyped images. Bring the best out of people in your message – avoid the unethical manipulative game of the fear factor that is so present in Cold War propaganda. Here are some suggested readings on Cold War propaganda, which were used for this project’s segment. Fascinating. Shows how ridiculous we were about the effects of a nuclear bomb. Could terrify children. I will run a propaganda museum and I hope to be able to obtain these videos and movies for the public. I happen to be doing an Internal Assessment, and this was exactly what i needed for one of my sources. However, could you please tell me the date this site was published? It would be extremely helpful, thanks! Hello there! I was intending on using some of this blog post in my uni work, could somebody please let me know who the author is so I can reference them properly? Thanks! Hi Joe, how can I help?